High-performance phase change materials (PCMs) are regarded as a promising strategy in thermal energy storage applications. However, pure PCMs exhibit some inherent disadvantages such as leakage, low thermal conductivity and poor thermal cycling stability. Herein, this work presents novel microencapsulated PCMs with nano-Al2O3-enhanced shell materials due to the high thermal conductivity and mechanical properties of nano-Al2O3. And nano-Al2O3 was contributed uniformly to the shell materials through self-assembly of functional materials, forming a connected thermal conductive network for the microencapsulated PCMs and resulting in an enhancement on the thermal conductivity of the microencapsulated PCMs. 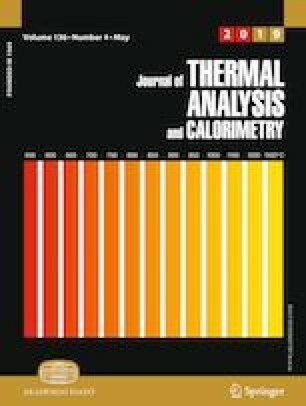 Results show that thermal conductivity of the obtained microencapsulated PCMs with 8 mass% nano-Al2O3 is improved up to 0.5977 W m−1 k−1 which is about 287.4% compared with that of the pure PCMs. Moreover, the obtained microcapsules enhanced by nano-Al2O3 possess good phase change behavior and excellent thermal cycling stability, whose melting enthalpy can achieve 170.5 J g−1 and almost has no change after 12 times of thermal cycles. The authors gratefully acknowledge the support from the National Key R&D Program of China (2018YFB1501200, MOST), the National Natural Science Foundation of China (Grant Nos. 51102230, 51462006, 51371060, 51361005, 51563003, 5187011196, U1501242, 51671062), the Guangxi Natural Science Foundation (Nos. 2014GXNSFAA118401, 2013GXNSFBA019244, 2014GXNSFDA118005, 2015GXNSFAA139255), the Guangxi Collaborative Innovation Centre of Structure and Property for New Energy and Material (2012GXNSFGA06002), the Scientific Research and Technology Development Program of Guangxi (AD201723029, AD17195073, AA17202030), Innovation Project of GUET Graduate Education (2016YJCX21, 2018YJCX88), Guangxi Talents Small Highlands for Advanced Functional Materials Basis and Application and Program for Postgraduate Joint Training Base of GUET-CJYRE (No. 20160513-14-Z).